Does facebook tax and erode the mystery and benevolent hallucinations of separation and the awaiting of the message from the concealed friend, the sexual weed or familiar error-wanderer navel? Does facebook allow for distance to end like a wadi can end–or does it maintain separation till numb death, by manufacturing the illusion of a semblance of the other’s presence, of the warm foreign shadow? Does facebook make false pitch, and make visible, separation’s song? Blog for Arturo Desimone, poet, writer, and visual artist (drawings) born 1984 Aruba, Dutch Caribbean, an Argentinean citizen, lived last several years in the Netherlands but leads a nomadic existence. The style of drawings can be compared to surrealism, my influences are surrealism, Russian Orthodox ikons, art of Mediterranean antiquity, the black paintings of Goya, Domenikos Theotokopoulos, most of all Jheronymus Bosch. I was born on a Dutch colony only because Jheronimus Bosch was Dutch and it might therefore be easier to come into contact with him in neglected library books no one else inhabiting the desert island would ever glance at. 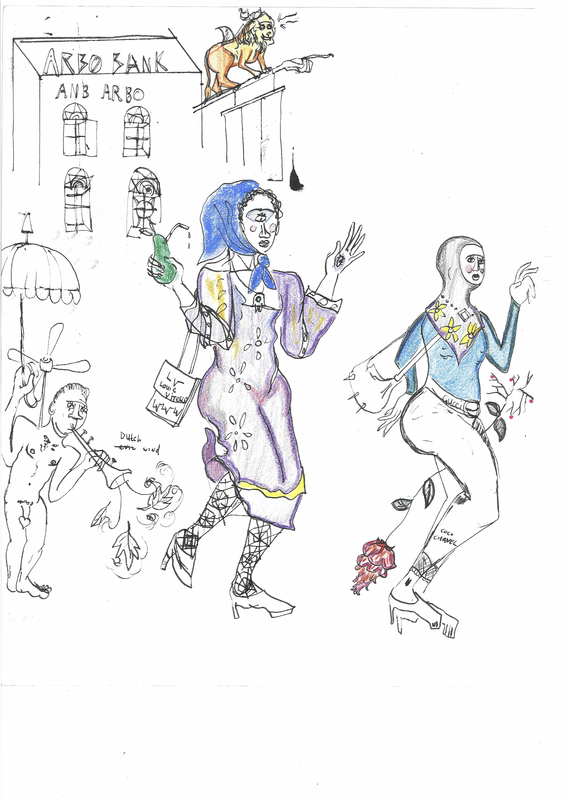 I mention the drawings first because of the recent exhibition in Mezrab, Amsterdam’s cultural nightclub. I want from there to go to other galleries and venues, but these drawings are mainly intended as companions to poetry and literary texts, prose, arguably in the fashion of Bruno Schulz. The emphasis in my life is writing, the drawings are the blood hemogoblin siblings of stories and poems. So far have a few poetry publications, a prize in an Amsterdam-based literary contest for my stageplay-script, written in the English language, and freelance journalism publications. My poem ‘Was it you?’ was published in The Brown Critique, an online literary quarterly based in India in their July issue. See under xiii. So far this is my only poem published online. See here for more links to poems published.